Burnley are looking into the possibility of putting home fans back in the David Fishwick Cricket Field Stand. Clarets supporters were last housed in that stand five years ago in the club’s first Premier League season, but it has been exclusively for away fans since. That has been a bone of contention with many, who feel the acoustics of the stand, and the fact it is directly above the dressing rooms, are key in generating vocal backing and supporting the team. The counter argument has been that support would be dissipated unless other parts of the ground are full, but Chief Executive Lee Hoos is pleased with the home support so far this season, and said: “The fans have been fantastic - we’re pleased with home attendances, and they are growing. 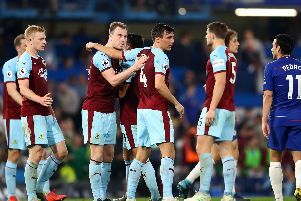 “We still had 17,000 in poor weather on Saturday against Crystal Palace, and it is reaching the point where, if we can sustain that support, we will look at doing what we can do to put home fans in the David Fishwick Stand. “We have to have an otherwise full stadium in terms of home support, as we don’t want to dissipate that support and leave gaps elsewhere. “We want to do everything we can to help the manager and the players, and if we can do it, we will try.